* Open house on saturday 19 January from 10.00 to 11.00. You are welcome! 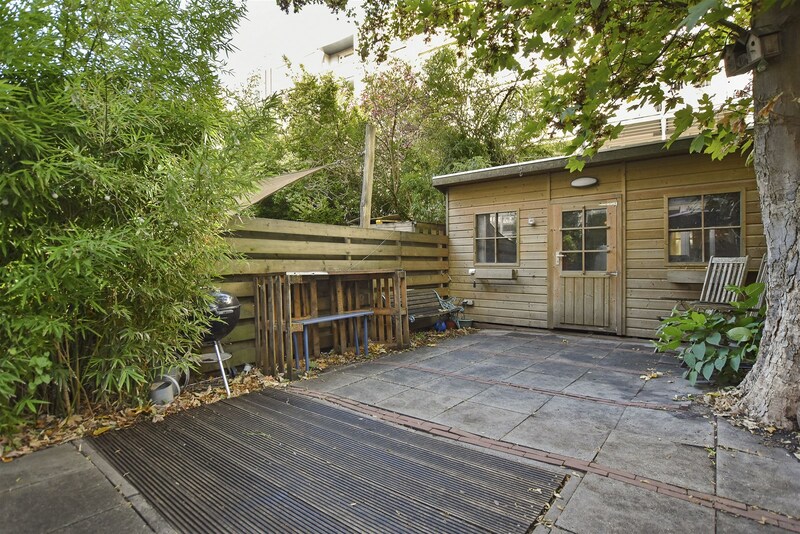 Delightful ground-floor residence with private entrance and a garden no less than 13 metres deep in the heart of the popular area of De Pijp. The property is 72 sq. m., freehold, with two spacious bedrooms, a large walk-in closet and a generously-sized shed. 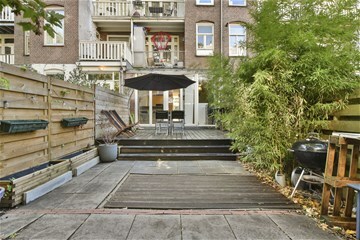 Private entrance on the Cornelis Trooststraat. Enclosed porch, foyer with access to a handy laundry room/store room. The living room is located at the rear of the residence and has an open kitchen. This room feels light and airy thanks to the large, 3-metre high ceilings. The kitchen is located at the rear and equipped with a dishwasher, refrigerator, freezer and oven. The U-shaped design with two small bars makes this eat-in kitchen a wonderful place to relax. You can access the delightful garden from the kitchen. The garden totals 75 sq. m. and has a spacious shed of about 10 sq. m. The garden is north-facing but thanks to its stunning 13-metre depth you can still enjoy the sun at any time of the day. 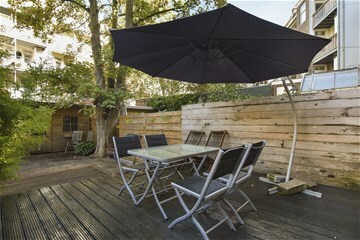 In the summer, you can enjoy the sun on your terrace until approximately 9.30 pm. 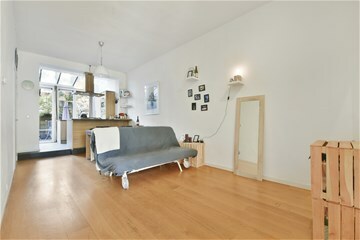 The master bedroom (4.57 x 1.68) is situated to the rear of the property and comes equipped with a central heating cupboard. The second bedroom is located at the rear, has a spacious walk-in closet and totals 14 sq. m. The deluxe bathroom has a bath, toilet and wash basin. 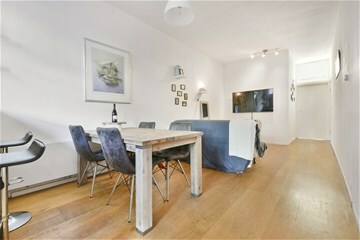 The residence is located in the middle of the lively area of De Pijp in one of the most desirable locations in Amsterdam, a mere stone's throw from Museumplein, the Concertgebouw and the Vondelpark. Van Baerlestraat, Ceintuurbaan and the Hobbemakade are just around the corner. Due to this central location, you will find a wide variety of shops and restaurants within walking distance. Excellent public transport connections (tramlines 3, 5, 12, 16 and 24) and various exits (A10 orbital road). The Amsterdam Zuid railway station is a ten-minute bike ride away and thanks to the opening of the North-South metro line, with a stop around the corner, the area’s accessibility has improved even more! 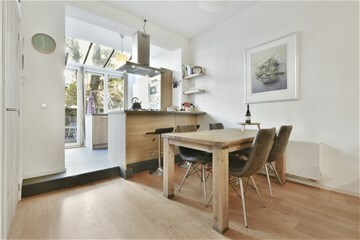 - Spacious 65 sq. m. garden, and due to its depth you can enjoy the sun at any time of the day. 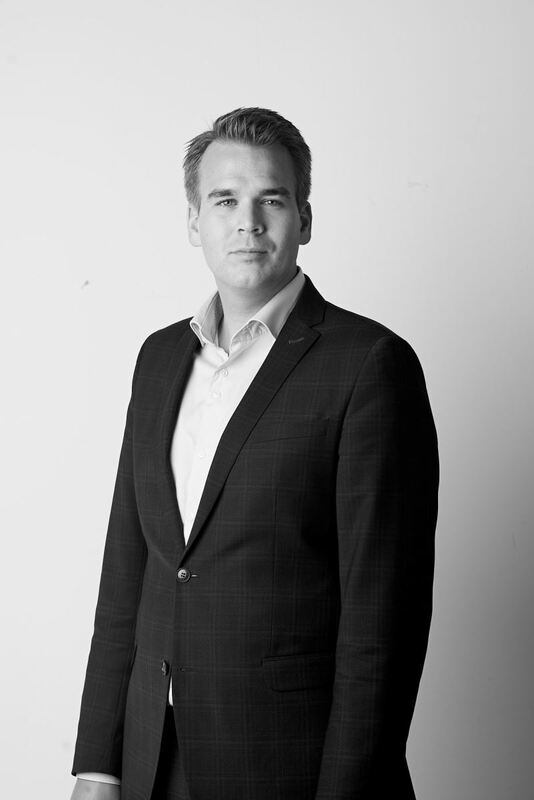 - The home owners’ association has four members and is self-managed. The monthly service fee is €105.